Due to the mounting evidence that continues to show strong associations between good nutrition and a decreased risk of cognitive decline in older adults, I led a team of medical doctors and scientists from Boston University School of Medicine and Tufts University School of Medicine to develop the evidence-based Memory Preservation Nutrition (MPN) program in 2005. Later, dietitians, nutritionists, and educators joined me in implementing the MPN program in adult day programs, senior residences, and for individuals of all ages. Team members who helped implement the MPN program include Cheryl Franchi, MS, MBA, RD, CSG, LD/N, FADA, FAND; Jayne Hunter Gilbert, MEd, RD, LD, FADA; nutritionists Nadja Meireles and Kristina Scangas; and educator CC Donelan. The evidence-based MPN program is an integrated whole-foods nutrition program that improves cognitive and emotional health while increasing overall health. It’s continually updated and enhanced as new brain-relevant research becomes available. Researchers studying Alzheimer’s disease (AD) believe brain changes and damage begin years before AD symptoms appear, indicating the need for early intervention. Following the MPN program can help protect brain health, delay the onset of AD and other dementias, and even help those already experiencing cognitive problems. MPN involves following six key strategies that target specific biological outcomes. Each strategy involves consuming a variety of foods that RDs can customize to each patient according to his or her individual tastes, preferences, ethnic/cultural proclivities, and available foodstuffs and allowing for flexibility in the presence of comorbidities or food allergies/intolerances. MPN’s overall goal is to promote brain health and, specifically, to reduce the risk of AD and other neurodegenerative diseases, delay the onset of symptoms in those with presymptomatic AD, and slow progression in those already diagnosed with mild cognitive impairment (MCI) or AD. An additional objective is to promote overall health, particularly in the areas identified as being closely related to brain health: sugar metabolism, healthy insulin function, and healthy cardiovascular function. Dietitians can introduce the MPN program to clients and patients through physician referrals or on their own in homes, hospitals, long term care facilities, and other foodservice institutions. • They increase their intake and the variety of antioxidants they consume, including those found in spices, nuts and seeds, whole grains, green leafy vegetables, and berries. • They boost their consumption of omega-3s and other healthful fats (eg, monounsaturated), such as those found in fish and seafood; walnuts; seeds such as flax, chia, and hemp; canola and extra-virgin olive oils; leafy greens and purslane; and flax, fish, and marine oils. They also eat fewer foods containing omega-6s, including corn oil. • They choose anti-inflammatory foods such as fish, berries, spices, and vegetables, and reduce sugar and animal food intake. • They work to reduce insulin resistance by limiting their sugar intake and eating complex carbohydrates such as beans and lentils, root vegetables, and whole grains (along with other foods listed here). • They work to reduce their LDL cholesterol level and their intake of animal-based saturated fats. They also avoid trans fats. • They consume adequate amounts of vitamins B, D, and E, which are critical for brain health. Those of particular importance include vitamin D3; the family of eight vitamin Es, including tocotrienols; vitamin B12; and niacin. Patients following the MPN program should consume more plant foods and fewer animal foods. They should obtain their nutrients from whole foods or juices, reducing their consumption of processed foods as much as possible and preferably avoiding them. They should stay hydrated, preferably by drinking plenty of water. Probiotics and prebiotics are important for maintaining good gut microbiome health. To achieve this goal, patients can eat fermented foods such as Greek yogurt, pickles, and sauerkraut along with foods high in insoluble fiber polysaccharides. The MPN program advocates replacing dietary salt and sugar with herbs and spices. All spices, herbs, teas (especially green tea), and dark chocolate, which are potent antioxidants and anti-inflammatories, help protect the brain and heart. Some studies have established spices, including cinnamon, turmeric, and hot peppers, as potent means of reducing LDL cholesterol and improving blood sugar levels and insulin resistance.8-10 The emphasis on herbs and spices as a nutrient-dense, delicious way to maximize MPN’s key strategies helps distinguish it from other programs. Fish, seafood, and other sources of omega-3 fats also are important for good brain health; fatty fish such as salmon, sardines, and tuna are especially beneficial along with plant-based sources such as leafy greens, walnuts, and seeds such as chia, flax, and hemp. The recommendation is to eat fish or seafood at least three times per week and omega-3–rich plant foods daily. Marine oil supplementation also is recommended. MPN focuses on reducing cholesterol and animal-based saturated fats while increasing healthful fats, especially omega-3 and monounsaturated fats. People diagnosed with MCI or AD may benefit from consuming a higher proportion of calories from healthful fats found in extra-virgin olive oil, sesame oil, avocados, nuts, and seeds. Excess sugar consumption has been linked to brain problems such as hippocampus shrinkage, increased beta-amyloid levels, impaired insulin function and glucose use in the brain, impaired memory and cognitive processes, and increased LDL cholesterol.18-24 Therefore, patients should limit their intake of sugars and foods that are quickly converted to sugar after consumption, such as starches and refined grains, including white rice, white skinless potatoes, and products made with white flour. Nutrition is pleiotrophic, working simultaneously through multiple mechanisms. In terms of brain health, similar and complementary nutrients promote both cognitive and emotional health. With regard to AD, MPN is designed to block or delay multiple mechanisms identified as possibly related to AD etiology with minimal or no side effects. For example, omega-3 fatty acids can reduce beta-amyloid burden, improve cognition, and protect against dendritic pathology. Because scientists don’t agree on the sequence of causal events or whether there may be multiple pathways that result in the classic pathology of AD, nutrition can be an excellent recourse to recommend to clients and patients already dealing with cognitive impairment or diagnosed with MCI or AD as well as those considered to be at risk based on family or medical history. Some studies show that people with an elevated risk of AD due to the APO E4 allele gene can reduce their risk by eating a brain-healthy diet and getting regular physical activity.25,26 The mechanisms by which specific foods may help or harm the brain appear to vary, and with many whole foods, there can be multiple actions at work simultaneously. Moreover, foods work together synergistically. For example, while olive oil and leafy greens are individual brain foods, when eaten together the olive oil promotes better absorption of the leafy greens’ key antioxidants, such as lutein and zeaxanthin, thus increasing their health benefits. • improving neuronal signaling and synapse activity, restoring the mitochondrial function (related to energy) of brain cells, and retarding tau pathology (the other problem protein in AD). Additional pathways that are positively influenced by nutrients (evidence based) include microtubule stability, microgliosis, metal ion homeostasis, cAMP-response element-binding protein, calcium channel regulation, phosphorylation state of extracellular signal-related kinase, and improved vascular function. If it’s difficult for an individual with moderate AD to adopt MPN on his or her own, caregivers or companions taught to follow MPN can offer assistance or partnership to adhere to the program. People with MCI and mild AD can make changes on their own with the help of MPN guides and menus, recipes, and shopping lists (available at http://www.brainwellness.com) along with occasional coaching. Individuals’ motivation varies, but the idea of being able to maximize brain power or preventing or slowing MCI and AD by eating specific foods, particularly with the broad choices available, may be enough to prompt people to adopt a lifestyle change and embrace MPN. MPN appears safe and should improve overall health. However, it’s important to remember that good food choices are most beneficial when combined with adequate sleep, frequent physical exercise, mental stimulation, and social activity. — Nancy B. Emerson Lombardo, PhD, is a founder of the national Alzheimer’s Association and Alzheimer’s Disease International. She is an adjunct research assistant professor of neurology at Boston University School of Medicine and Boston University Alzheimer’s Disease Center and the recipient of a grant to study a combination of nutritional supplements based on the MPN. She also is president of the Brain Health and Wellness Center. 1. Lee S, Lemere CA, Frost JL, Shea TB. Dietary supplementation with S-adenosyl methionine delayed amyloid-beta and tau pathology in 3xTg-AD Mice. J Alzheimers Dis. 2012;28(2):423-431. 2. Fu Z, Zhang W, Zhen W, et al. Genistein induces pancreatic beta-cell proliferation through activation of multiple signaling pathways and prevents insulin-deficient diabetes in mice. Endocrinology. 2010;151(7):3026-3037. 3. Scarmeas N, Stern Y, Mayeux R, Luchsinger JA. 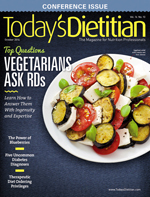 Mediterranean diet, Alzheimer disease, and vascular mediation. Arch Neurol. 2006;63:(12):1709-1717. 4. Gu Y, Luchsinger JA, Stern Y, Scarmeas N. Mediterranean diet, inflammatory and metabolic biomarkers, and risk of Alzheimer’s disease. J Alzheimers Dis. 2010;22(2):483-492. 5. Scarmeas N, Stern Y, Mayeux R, Manly JJ, Schupf N, Luchsinger JA. Mediterranean diet and mild cognitive impairment. Arch Neurol. 2009;66(2):216-225. 6. Joseph JA. Shukitt-Hale B. Casadesus G. Reversing the deleterious effects of aging on neuronal communication and behavior: beneficial properties of fruit polyphenolic compounds. Am J Clin Nutr. 2005;81(Suppl 1):313S-316S. 7. Joseph JA, Denisova NA, Arendash G, et al. Blueberry supplementation enhances signaling and prevents behavioral deficits in an Alzheimer’s disease model. Nutr Neurosci. 2003;6(3):153-162. 8. Khan A, Safdar M, Ali Khan MM, Khattak KN, Anderson RA. Cinnamon improves glucose and lipids of people with type 2 diabetes. Diabetes Care. 2003;26(12):3215-3218. 9. Khan A, Bryden NA, Polansky MM, Anderson RA. Insulin potentiating factor and chromium content of selected foods and spices. Biol Trace Elem Res. 1990;24(3):183-188. 10. Ahuja KD, Ball MJ. Effects of daily ingestion of chilli on serum lipoprotein oxidation in adult men and women. Br J Nutr. 2006;96(2):239-242. 11. Akhondzadeh S, Noroozian M, Mohammadi M, Ohadinia S, Jamshidi AH, Khani M. Salvia officinalis extract in the treatment of patients with mild to moderate Alzheimer’s disease: a double blind, randomized and placebo-controlled trial. J Clin Pharm Ther. 2003;28(1):53-59. 12. Akhondzadeh S, Noroozian M, Mohammadi M, Ohadinia S, Jamshidi AH, Khani M. Melissa officinalis extract in the treatment of patients with mild to moderate Alzheimer’s disease: a double blind, randomised, placebo controlled trial. J Neurol Neurosurg Psychiatry. 2003;74(7):863-866. 13. Akhondzadeh S, Shafiee Sabet M, Harirchian MH, et al. A 22-week, multicenter, randomized, double-blind controlled trial of Crocus sativus in the treatment of mild-to-moderate Alzheimer’s disease. Psychopharmacology (Berl). 2010;207(4):637-643. 14. Frydman-Marom A, Levin A, Farfara D, et al. Orally administrated cinnamon extract reduces beta-amyloid oligomerization and corrects cognitive impairment in Alzheimer’s disease animal models. PLoS One. 2011;6(1):e16564. 15. Yang F, Lim GP, Begum AN, et al. Curcurmin inhibits formation of amyloid beta oligomers and fibrils, binds plaques, and reduces amyloid in vivo. J Biol Chem. 2005;280(7):5892-5901. 16. Wang J, Ho L, Zhao W, et al. Grape-derived polyphenolics prevent A-beta oligomerization and attenuate cognitive deterioration in a mouse model of Alzheimer’s disease. J Neurosci. 2008;28(25):6388-6992. 17. Okereke OI, Rosner BA, Kim DH, et al. Dietary fat types and 4-year cognitive change in community-dwelling older women. Ann Neurol. 2012;72(1):124-134. 18. Starr VL, Convit A. Diabetes: sugar-coated but harmful to the brain. Curr Opin Pharmacol. 2007;7(6):638-642. 19. Convit A, Wolf OT, Tarshish C, deLeon MJ. Reduced glucose tolerance is associated with poor memory performance and hippocampal atrophy among normal elderly. Proc Natl Acad Sci U S A. 2003;100(4):2019-2022. 20. Bayer-Carter JL, Green PS, Montine TJ, et al. Diet intervention and cerebrospinal fluid biomarkers in amnestic mild cognitive impairment. Arch Neurol. 2011;68(6):743-752. 21. Craft S. Insulin resistance and Alzheimer’s disease pathogenesis: potential mechanisms and implications for treatment. Curr Alzheimer Res. 2007;4(2):147-152. 22. Cao D, Lu H, Lewis TL, Li L. Intake of sucrose-sweetened water induces insulin resistance and exacerbates memory deficits and amyloidosis in a transgenic mouse model of Alzheimer disease. J Biol Chem. 2007;282(50):36275-36282. 23. Te Morenga LA, Howatson AJ, Jones RM, Mann J. Dietary sugars and cardiometabolic risk—systematic review and meta-analyses of randomized controlled trials of the effects on blood pressure and lipids. Am J Clin Nutr. 2014;100(1):65-79. 24. Chowdhury R, Warnakula S, Kunutsor S. Association of dietary, circulating, and supplement fatty acids with coronary risk: a systematic review and meta-analysis. Ann Intern Med. 2014;160(6):398-406. 25. Kivipelto M, Rovio S, Ngandu T, Kåreholt I, et al. Apolipoprotein E epsilon4 magnifies lifestyle risks for dementia- a population-based study. J Cell Mol Med. 2008;12(6B):2762-2771. 26. Gardener SL, Rainey-Smith SR, Scarmeas N, et al. Dietary patterns and cognitive decline in an Australian study of ageing. Molecular Psychiatry. 2014; Online ahead of print. doi:10.1038/mp.2014.79. 27. Kivipelto M, Solomon A, Ahtiluoto S, et al. The Finnish Geriatric Intervention Study to Prevent Cognitive Impairment and Disability (FINGER): study design and progress. Alzheimers Dement. 2013;9(6):657-665. • in-person presentations and webinars (planned).